Having March already passed, June attempters for CFA LI exams must have gone through at least 60% of the total course and must be attempting some sample practice papers. This blog is meant for the ones who have recently started and have not been able to accomplish 50% of the coursework. See, CFA L1 is not a test of brilliance, but a test of discipline organized approach and multitasking (That’s what CFA charter also has its maximum weight). On a personal level, these things have a bigger impact on a personality than the qualification. I would pick one heavyweight subject (FRA, Fixed Income) and a light one (Portfolio managementAlternate Investments) simultaneously. So by doing this, I will have enough flexibility to rest my brain sufficiently along with not ignoring the minority weighted subjects till the last moment. I approached the total curriculum not relying upon over a few bigger topics to be done at priority. Trust me, when you go through all the subject 2-3 times, you get to see the correlation between the concepts across the majority of subjects which boosts your confidence as well as the understanding of the subject. Giving at least 5-6 attempts of full-fledged practice papers will enable you to experience the tiredness the brain experiences while attempting the second leg of the examination. And again, my personal experience says, it will help more than a lot! The brain needs rest, take time to meditate, eat, drink a lot of water, keep yourself cool during the break and do not think about the exam. Basically what happens is, when you are done with the first leg, assuming your attempt was above average, your friend who also is a co-candidate starts to discuss his/her paper and starts to influence your mental stability. You might enter the second leg in a nervous state and pressurize yourself. It is a matter of personal mental poise and concentration. The questions are not going to be difficult, it’s tricky! That’s why you need your brain to be fresh and not engage in chit-chats. I did not even prefer opening my books and go through the basics. CFA exams are mostly conducted in 5star hotels… relish the posh lobby, sit at some guest corner, admire the interiors, take a sip of nice latte, look at various people walking across… my mind was all fresh after that silent break of gazing the surrounding for just 20 odd minutes. And again, be it CFA L1, L2, L3, all the second leg exams were much easier than the first leg. So, don’t screw your mental concentration by engaging in chit chats, gossips, eating too much out of excitement/nervousness and most importantly, by discussing your paper with anyone. 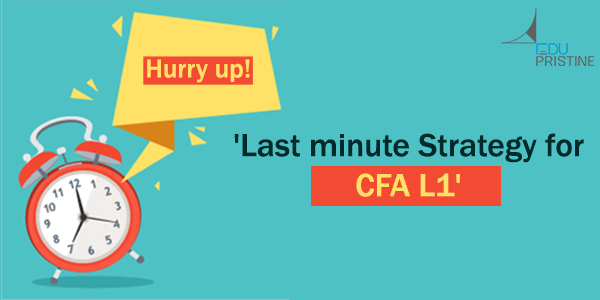 It is still not late to start for CFA L1 attempt for a commerce background guy. But remember, CFA is not a qualification in itself, it is a Charter… a respect… given to those who happen to be disciplined, organized, planners and have a keen eye to be able to multitask… that’s what is required out of CFA in the industry too. Like I said in my last blog it’s not a promise to a high package job, its a promise to a high-quality job…and the package follows with due time!